Workadu gives you everything you want from a business management system, and more! Show your next available service, rate and time slot available during the booking process. We keep your website safe by verifying the email validity of new customers. Allow your customers to sign up through social media. 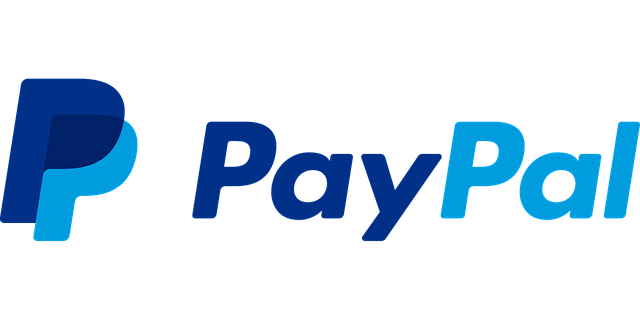 Paypal, Stripe, Payzen, Viva Wallet and many more! We give you an advanced search form with customised filters to help your customers find exactly what they are looking for. 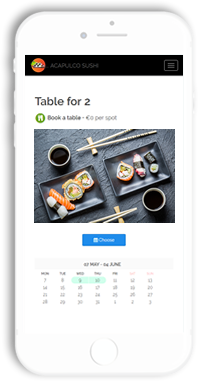 Offer your customers an enjoyable booking experience that works incredibly well on both mobile and desktop. Enjoy a SEO-optimised website that can be easily integrated with Google Analytics. All websites built with Reservation Engine work on all portable and desktop devices. There is no need to know coding. Build your website with a few clicks. You choose the colours, graphics and layout of your website. Protect your business with high-end encryption, conformity with EU law and HIPAA compliance. Attach special notes to your bookings, such as client instructions and memos. See all available resources in one place. Customise your emails and notifications based on your branding and business needs. English, French, Spanish, Greek, Hungarian & Turkish. More languages coming soon. Assign up to 6 roles to an unlimited number of team members and run your business online smoothly. Offer your services from different locations. With Reservation Engine you can work on the go, from any device, even your mobile. Give access to all your staff and partners, and add all your products and services without hassle. Whether big or small, we accommodate businesses of all sizes. Get up and running in only a few minutes. A complete overview of your resources, statistics and activity. 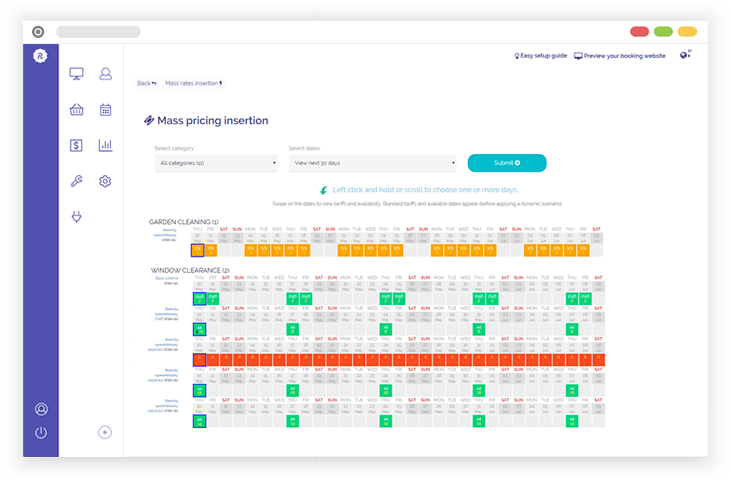 Easily manage your bookings and set your pricing policies from a single interface. Electronic ticketing with automating assignment and easy check in scan. 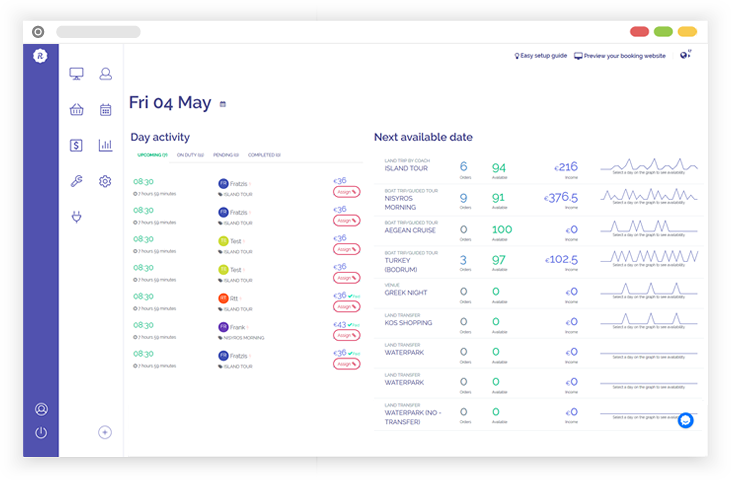 View, add and edit your bookings from a single place. 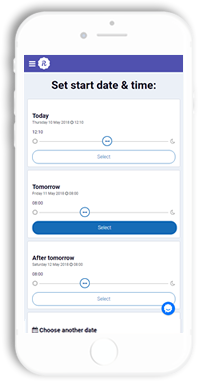 Synchronise all your appointments online. Accept automated online bookings. Add walk-ins and telephone bookings manually. Keep your customers informed regarding their order at all times. You are in control of your data at all times. Customised booking confirmation with booking number and QR code. Know what your stock and available personnel is at all times and manage your resources. Offer your products or services on your partner’s website. Send reminders to your team members and clients with a click of a button. 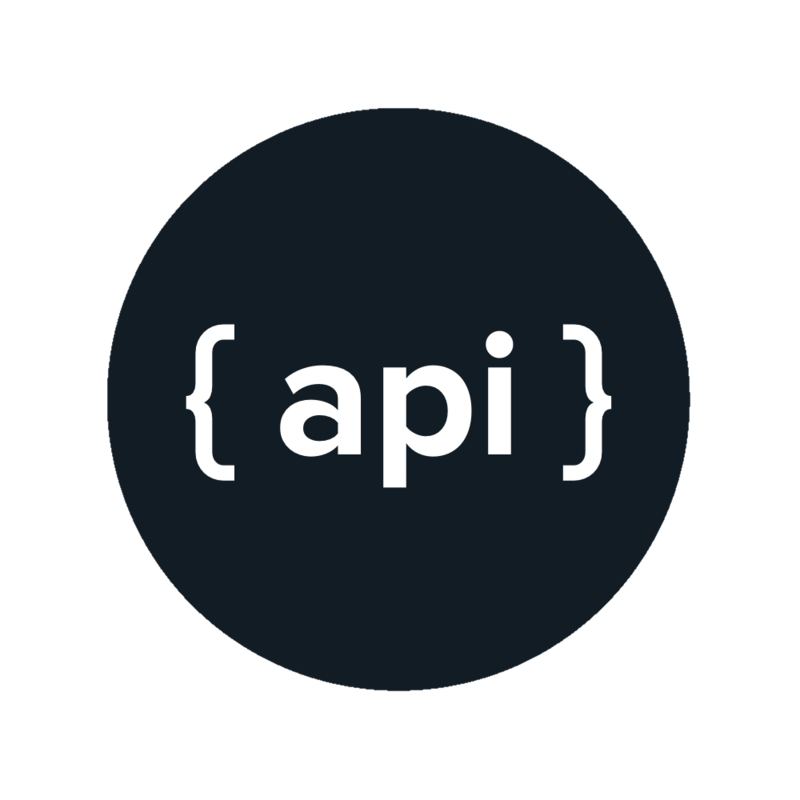 Support of daily, hourly or custom interval rates. Assign a resource available for more than one service manually or automatically. Give them access and allow them to import their own catalogue and availability. 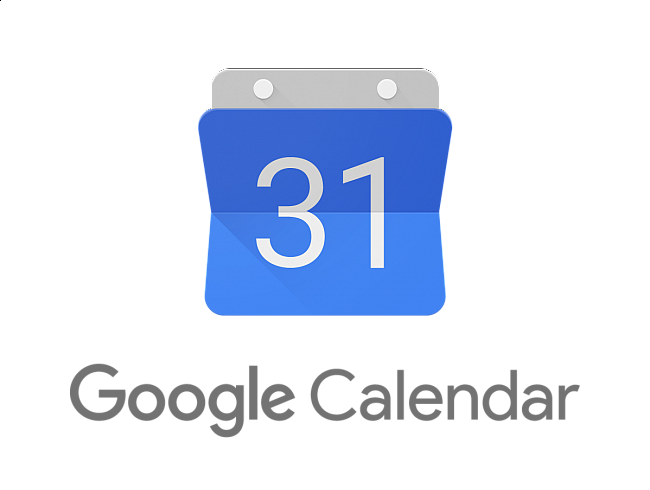 Automatic booking assignment to the next available resource. 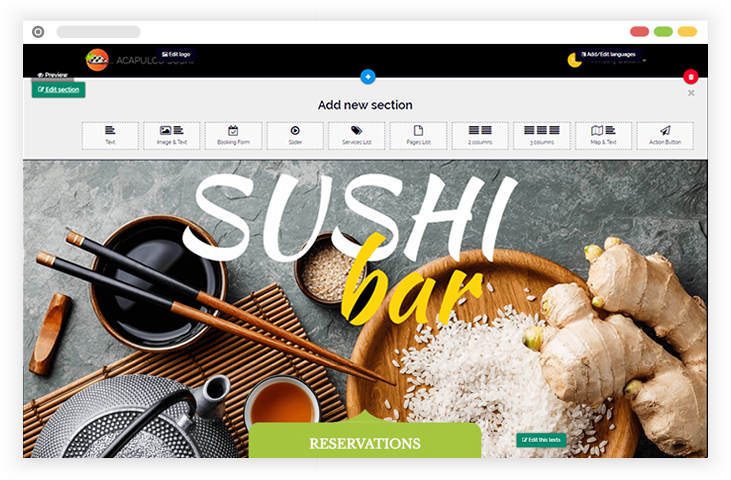 Stress-free booking cancellations and modification for both your customer and your business. Adjust your booking availability to your business hours. 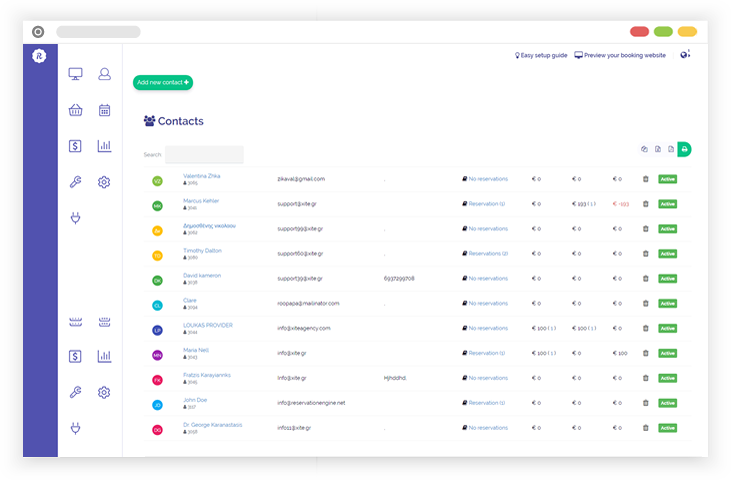 Set automated emails for your customers for advisory, sales, marketing or other purposes. An online database with your customers’ details, order history and invoices issued. Create pricing policies for a specific time period or vehicle, or for a specific number of reservations. 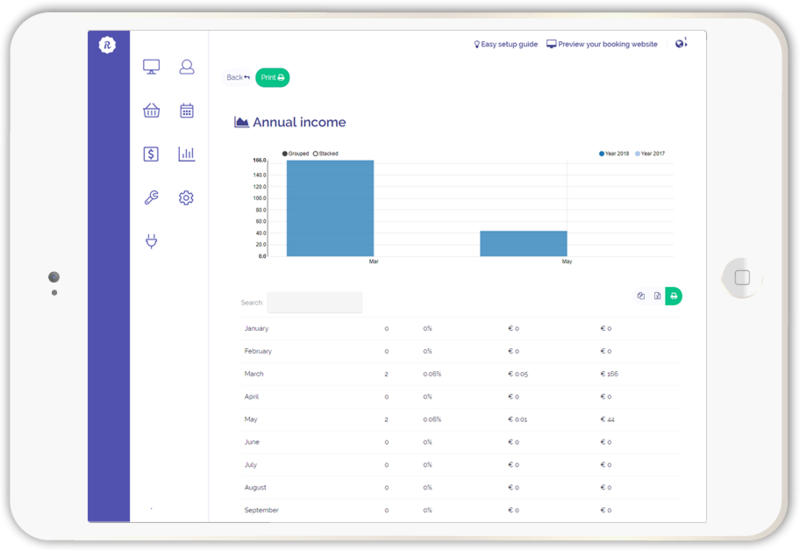 Daily, monthly and yearly reports of your bookings, income and resource occupancy. Stay on top of your earnings with clever graphs and stats that crunch the numbers for you. Automated electronic invoices are issued after every successful payment, or issue new invoices manually. 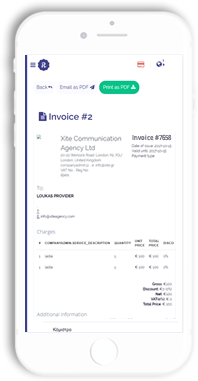 Issue and edit unlimited expense and payment invoices that are automatically stored in your database. Automate your work using content integrations. 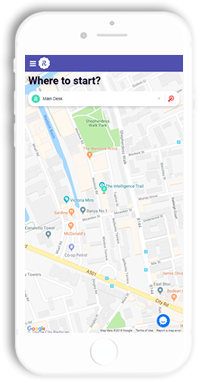 Connect your favourite apps and services in one place and reduce time and cost with the click of a button.